What's the buzz about A/B testing? It seems all the conversion gurus and landing page companies are talking about it. But to most of us it sounds really nerdy and complicated. A/B testing is the key to success in your online business. A/B testing is pretty straightforward, and can mean the difference between anemic results from your landing page and steady, progressive success in your online business. We decided to put together this overview to explain A/B testing to the newbie: why it’s important, what’s involved with an A/B test, and what are the basics to get you started. As applied to your website, it’s the disciplined application of regular testing to ensure you have the best version of your website optimized for conversions. Conversions are the holy grail of online business. It’s the only reason you should have a website in the first place. Every website should have as its goal to convert your target market into a customer. B2B Marketers:A B2B marketer may convert a corporate decision-maker into a newsletter subscriber to communicate with her over time about your industry and the value of your offering. Ecommerce Sites: For an ecommerce site, a conversion means to turn your visitors into purchasers of the products you’re selling. Bloggers: Bloggers may have different reasons for existing, but the prime conversion action for a blogger is to drive subscriptions, either to their RSS feed or their newsletter. Sometimes bloggers sell information products, such as eBooks, training programs or conferences. So bloggers then want to convert subscribers into customers. The Corner Store: For a hair salon, pet store, tea shop or organic products shop, a conversion could be printing out a coupon, calling your store to find out your hours, or even submitting an online order they can go pick up at your retail location. A website should be designed to convert people into customers, Period. An A/B test allows you to test two or more versions of the pages where you have placed your conversion action to find out which page has a higher conversion rate. This page is called a Landing Page. We sell landing pages, but we also use landing pages to convert visitors into customers. 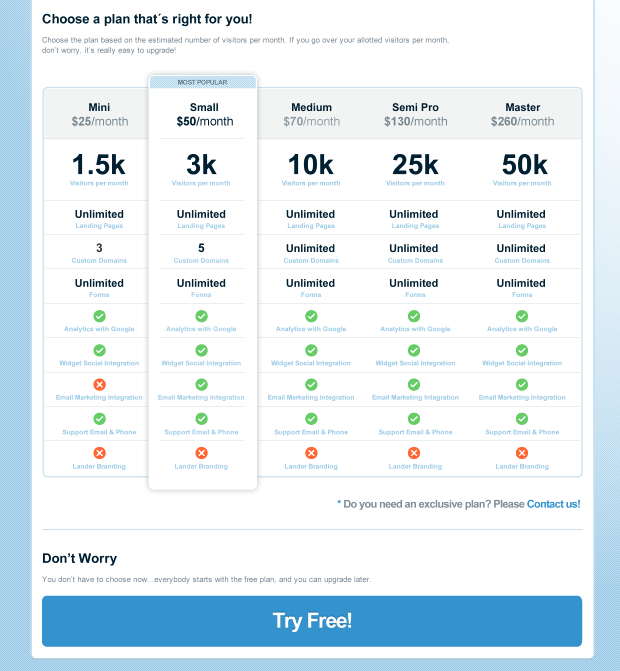 In our own webiste, we show a landing page for our pricing plans and we display a big blue button that says “It’s Free.” When you click that button you are taken to a sign-up page. That’s our call-to-action. When implementing an A/B test, you will deliberately create two or three different versions of that landing page. Using an A/B testing tool, you can randomly deliver these different pages to visitors. Then compare the conversion rate of each landing page. What do you measure with your A/B test? An A/B test, as mentioned above, allows you to measure which version of a landing page converts better. For this you have to know what your conversion rate is. Massey cites an example of a website that drives 10 buyers for every 1000 visitors. Dividing the 10 buyers by 1000 visitors you get a one percent conversion rate (10/1000 = one percent). To improve your conversion rate, you can increase the “Actions” or conversions your visitors take, while keeping traffic constant. You can also reduce the amount of traffic while keeping actions, or conversions, constant. Each one of these increases your conversion rate. To conduct an A/B test, create two or three different versions of your landing page (Lander has a built-in A/B testing tool that allows you to test up to three different versions of your page). You can go crazy changing and comparing every single element on your landing page, but we recommend keeping it simple and sticking with the basics. The body copy: Most of us think of copy as the words written on a page. But copy can also include images and design. Peep Laja over at Conversion XL also has a good overview of conversion-oriented copywriting. The call-to-action: Your call-to-action can be a big fat juicy “Buy Now” button, sign-up form or a simple hyper-linked words that says “click here.” For a good overview of call-to-action buttons, read this article by Tim Ash at SiteTuners. A word about online forms, such as a newsletter or free trial sign-up: the more information you make your visitors fill out, the lower your conversion rate. Many companies just ask for a first name and email address when driving subscriptions. If you decide to ask for more information, your conversions may go down, but you also might get a higher quality subscriber. Think about your conversion goals first before making a decision on the length of your sign-up form. The positioning of the elements: Finally, will you put your call-to-action button in the middle of the page, or just below the body copy? Will you place your body copy to the left of your page and your sign-up form on the right? When conducting your A/B test, it’s best to change only one element from one page to the next. That way you can determine how that element affects conversions. Once you have decided which element you’ll test, you then have to decide the time period for your experiment. It’s important to test your landing pages over a given period of time, such as 1 week or 1 month. Finally, launch your experiment! Your A/B testing tool will provide the following statistics: number of conversions, your conversion rate, and the number of visitors to your landing page. What do you do after you conduct your A/B test experiment? After the testing period, it will become obvious which page performed better. You’ll also be able to tell which version of the element you were testing performed better. For example, if you tested your headline, you now have a better idea what type of headline works best for your target market. If you tested your call-to-action button, you’ll have a better idea what color works best for buttons. These are valuable lessons that can serve you well going forward. Our recommendation to you: you should always be testing. Why do some pages have a 23% conversion rate while most websites have a 2-3% conversion rate? Is it because the marketer that created the high-converting page was really brilliant? Maybe, but not likely. To get really high conversion rates you need to establish discipline of constant testing. Going back to the baseline concept I mentioned earlier, use your winning page as the baseline for your next experiment. Test that page against other pages you think might convert better. If your new page does worse, throw it away. Come up with a different versions and keep testing. If you create a version that performs significantly better than your baseline (e.g. from 2% to 4%, for example), implement the new version. A word of caution: make sure your sample size is big enough. The longer you conduct your tests, the more statistically significant your A/B test results will be. From your Dashboard, click the little blue button on the upper right of the green circle called “100%”. When you hover over it with your cursor a little bubble will appear that says “Duplicate variant.” You can click the blue button again to get a third variant. Click the Edit button for each variant, and change the elements you wish to change. When you’re finished, click the green “Save” button on the upper left of the screen, and click “Finish” on the upper right. You can then define what percentage of the time each landing page will be presented to your landing page visitors. Do this by sliding the vertical blue bar across the larger bar that sits vertically above the landing pages. The percentages will automatically change for each circle as you slide the blue bar left and right. After you set the percentage, click the big blue “Save” button on the upper right of your dashboard. The blue “Save” button will the turn into a green “Republish” button. Click the “Republish” button, then click to confirm that you would like to republish these pages. A/B testing is the key to success in your online business. It can become your best friend, and make you a hero with the C-suite when your conversions start to improve. We recommend conducting tests on your landing pages as a regular habit. Lander makes it very easy, so you don't have excuses for not start doing it. If you need help conducting your A/B tests, you can email us and one of our support reps will help you.